A B-52H Stratofortress taxis down the runway during Prairie Vigilance 16-1 at Minot Air Force Base, N.D., Sept. 16, 2016. 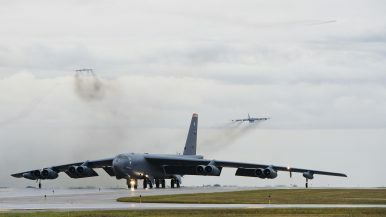 As one leg of U.S. Strategic Command’s nuclear triad, Air Force Global Strike Command’s B-52s at Minot AFB, play an integral role in nation's strategic deterrence. Nuclear weapons aren’t a solution to growing South Korean doubts about U.S. resolve and commitment. North Korea’s nuclear and missile breakthroughs have intensified regional tensions, triggered advocacy for a U.S. preventative military attack, and unnerved America’s allies. Pyongyang already can strike South Korea and Japan with nuclear-tipped missiles, along with massive conventional military forces. Both Koreas vow to strike preemptively if an imminent attack is detected or perceived. The risk of miscalculation is dire and rising. But it is the specter of the North’s imminent capability to assault the American homeland with nuclear weapons that prompts the most nervousness in Washington, as well as Seoul and Tokyo. North Korea’s successful intercontinental-range ballistic missile (ICBM) and hydrogen bomb tests earlier this year accentuated long-standing allied anxiety of abandonment. South Korea and Japan increasingly fear that Washington would refuse to come to their defense once Pyongyang demonstrates the unambiguous ability to hit the United States with nukes. “Will the U.S. really sacrifice Los Angeles for Seoul?” has become a prevalent refrain in Asia. South Korea’s strategic trepidation has prompted advocacy for compensating military options, including reintroducing U.S. tactical nuclear weapons that were removed in the 1990s. But this proposal is based more on anxiety rather than sound military reasoning. Proponents for such a proposal have yet to articulate how returning nuclear weapons to South Korea would provide diplomatic or military benefits. Some claim that redeploying tactical nuclear weapons would increase South Korean negotiating leverage with Pyongyang. But since the weapons would be American, remaining exclusively under U.S. control, Seoul would not accrue any additional influence. The ground-based U.S. nuclear weapons withdrawn from South Korea no longer exist. The United States does have tactical nuclear weapons in the Pacific Theater, but they are deployed on submarines and airplanes which North Korea is unable to target given their mobile, elusive nature. To remove nuclear weapons from those stealthy platforms and put them into underground bunkers in South Korea would be militarily counterproductive. During a crisis, the United States would need to remove the weapons from the bunker and return them to the delivery platforms where they currently reside. The U.S. may even feel constrained from doing so, lest Pyongyang perceive it as a prelude to an attack and thus trigger the crisis the alliance is seeking to prevent. Beside degrading alliance deterrence and defense capability, putting nuclear weapons in easily targetable, high-value bunkers would increase the likelihood that North Korea might attempt a preemptive attack. Nuclear weapon bunkers in South Korea would require defenses against North Korean attack, possibly necessitating the deployment of additional Terminal High Altitude Area Defense (THAAD) batteries. It’s hard to imagine military scenarios in which the presence of nuclear weapons in South Korea is beneficial. Actually, quite the opposite. In wartime, if North Korean forces were moving toward the nuclear bunker, allied forces would have to divert forces to prevent losing the nuclear weapons. Alternatively, the alliance may feel forced to use them before they are lost, having to go nuclear earlier than commanders may have wanted. Deploying U.S. nuclear weapons in South Korea would likely generate massive anti-American demonstrations. It is useful to remember the large protests against U.S. beef and deployment of the THAAD ballistic missile defense system – both based on fallacious assertions by South Korean progressives. These demonstrations, as well as those generated by the tragic deaths of two Korean schoolgirls after being struck by a U.S. armored vehicle in 2002, strained the bilateral relationship. U.S. nuclear deployment could also lead to greater Chinese economic retaliation against South Korea than that imposed by Beijing in response to the THAAD deployment. Are the South Korean government and populace willing to accept the costs of even stronger economic warfare from Beijing? South Koreans are now questioning U.S. resolve and commitment — despite America’s formal defense treaty commitment, statements of unambiguous steadfastness from the U.S. Commander in Chief and his senior military leadership, and the blood mutually shed during the Korean War. But most significantly, the United States has committed its most precious resource – the lives of our sons and daughters in uniform placed in harm’s way — to stand shoulder to shoulder with our Korean ally. Those of us with children in the U.S. military do not make that commitment lightly, but we do so to defend freedom and democracy at home and abroad. The Korean War Memorial in Washington, D.C., is a somber reminder of the tremendous sacrifices made during 1950-53. The inscription honors those “who answered the call to defend a country they never knew and a people they never met.” South Korea and its people are now well known to Americans. We will be there for you – the presence of a few nuclear weapons would do nothing to make that pledge any clearer. Bruce Klingner is Senior Research Fellow for Northeast Asia at the Heritage Foundation and previously served 20 years in the CIA and Defense Intelligence Community, including as CIA’s Deputy Division Chief for Korea.